Guess who turns 4 years old today? My blog! That’s four years of talking about books to be read, books to buy and the ever growing wish list. It’s four years of making some great friends in blogland. Peeps who feel like me about books. We get excited about book sales, about seeing a stack of books, etc. You guys are the best. It’s been a wonderful four years so far and I can only wish that there will be many more to come. 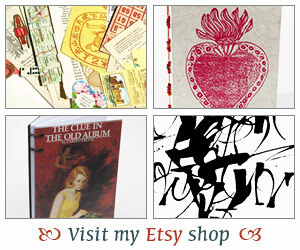 And, in Bookgirl tradition I’ll be having another giveaway for a handmade journal – actually make that two! So hope you’ll leave a comment and I promise to announce the winners in a couple of days. Now, I off to eat this cupcake. Congratulations!! I hope I can make this anniversary someday! Congrats! Your book recommendations are always great! 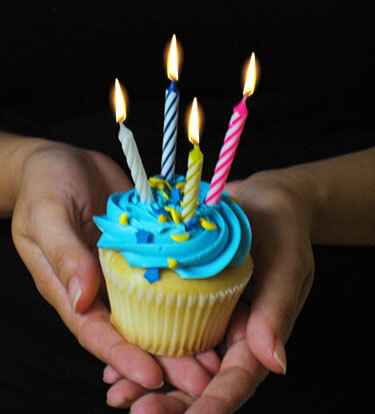 Happy Birthday blog! Wow, that cupcake looks really good. Please enter me in the drawing. Thanks! Happy bloggiversary! This is one of my favorite daily perusals. 🙂 Enjoy the yummy cupcake! Congratulations and happy birthday! That cupcake looks delicious! Happy bloggiversary! I only recently stumbled across your blog, but I’ve enjoyed it so far. Thanks for all the reviews. Yay!! Happy Bloggiversary Iliana! I’m so glad I found you and that you have kept on blogging. You were one of the first book bloggers I found and helped steer me in the direction I wanted to go with my own blog. And, of course, you have contributed a bit to my gigatismous TBR 😉 Keep up the good work! WOO HOO. Thanks for all the great reviews, pictures and love for books. *Raises glass* To many more years of Bookgirl. Now I have to get me a cupcake. Wow, to be dedicated for four years. And, having arrived at your blog only a couple of months ago, I can see that you are great at this blogging. I always look forward to reading your stuff!! Congratulations to you! I found you a few months ago and love “visiting” every day. Happy blog bithday. I hope there’s lots more cake to come. Oh, I’d love to be in on the drawing for one of your handmade journals…they are so beautiful!! Happy Blogiversary! Here’s to 4 more years (and many more). That cupcake looks yummy! Happy, Happy to you! I’ve only had my first blog for 3 years and my book blog for 2 1/2! And that seems like forever–can barely remember life before blogging. Fingers crossed on the journal – they are so beautiful! Happy Blogoversary! Four years is a long, long time, considering I’ve only been blogging for about a year and a half (and talking about books for just about six months). I too can barely remember what life was like before book blogging. Woo, very exciting! My one year is starting to sneak up and I’m getting quite excited about that. Here’s to another four years of blogging! I have been meaning to check in here for ages, I’m glad I got round to it in time for this! 🙂 Yours is a great blog, so here’s to many more years! Felicidades! How was the cupcake? Congratulations – it has been a great 4 years of watching your blog start and grow. I think there will be many more exciting years to follow…. Happy 4th Birthday to your Blog and Congratulations to you to have kept it up in such an interesting way. Thank you for entertaining me and the rest of the World with your great book adventures. Cheers. Happy Bloggiversary! To many more to come! Congratulations – I’ve only recently discovered you, but I am so happy to find other booklovers in cyberspace! Whoo hoo! Congratulations!! I’m glad you’re celebrating with cupcakes :). And also that I found your blog. Happy, Happy Blogiversary! Four years is an incredible achievement. It’s been wonderful getting to know you, so here’s to much longer in the blogworld. And wow – that cupcake looks amazing! Congratulations! Happy birthday to your blog! I’m very glad you’re blogging. I’ve been reading your blog for a couple of years–I especially enjoy hearing about the mysteries that you’ve read that I may not have discovered yet. Keep up the great blog! Congratulations! 4 years is long and I hope you continue blogging for many more years to come. 🙂 I hope the same for myself too! Happy blog-anniversary! Here’s to many more books! Happy bloggy birthday. Thanks for being here, Iliana. Wow. You are getting so old!! Happy Bloggy Birthday!! Happy belated birthday to your blog, Iliana! I enjoy our visits, reading your reviews and sharing in the book chatter. Happy belated birthday from me as well. Four years…congratulations. I hope my blog can last as long. I’m so very behind, so I didn’t get to tell you, but happy bloggiversary!